Ian Paisley - bacon, cheese, salad and an onion ring & any sauce! The Glenman - say cheese! The Lambeg - say cheese! Have you got Google Earth on your computer? If so, then download the Google Earth Map of For Cod and Ulster. 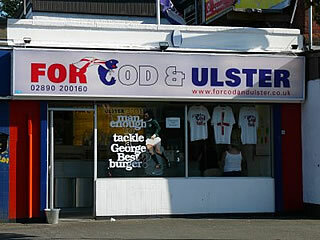 Is this the wrong position for For Cod and Ulster? If you think so, then modify its position. Had A fish supper best ive tasted yet!!!! will gladly drive 50 mile for another. not bad, but tried a wee place called valentinos not too far from kilkeel, think this place is better, hope you don,t mind me saying this . The best pastie i have every had, can't wait to have another. You can get a laugh and something to eat at the same time.